I love A.Saks products. They are lightweight and durable. As a 50+ woman I look for comfort, durability, the right amount of pockets and adjustable capacity for traveling abroad. 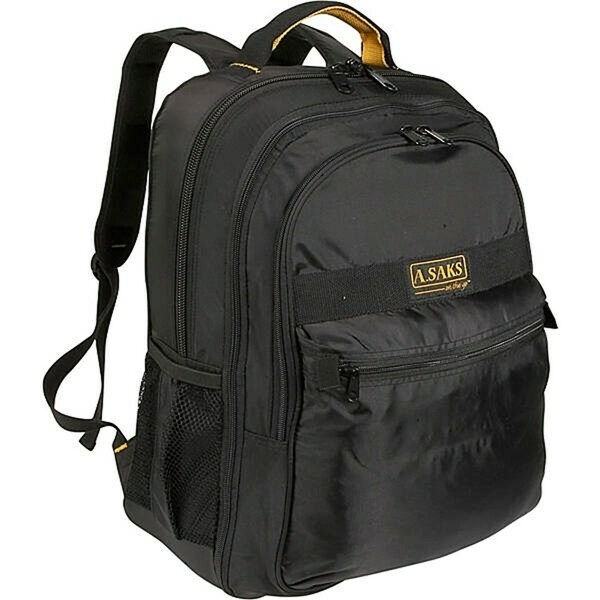 The a bag is comfortable enough you do not need to take it off your shoulders to carry it on your other luggage. The extra padding and light weight makes this a comfortable wear. I also look for something that has a little class to it or is understated enough to work for an "old lady" (LOL). I think this is just the thing and my kids would use it too! For traveling you can add all your electronics, and jacket and what not. It will comfortable fit under your chair when flying, and depending on what you have inside it will compress. Love it and highly recommend it. Definitely not big enough. Picture makes it look nice and big. I was very disappointed. "Does this bag have a sleeve so that it can be hung over the handle of my regular carry-on luggage? Thanks!" Hello debbiedesigns, thank you for your inquiry. Unfortunately, the information you have requested is currently unavailable. We will continue to try and answer this for you. You will receive an email notification once an answer is posted. Have a great day. "How much does this weigh? What sre the dimensions? How many smaller pockets does it have? Thanks AJ"
The shipping weight of this item is 3 lbs. The dimensions are 18 x 14 x 11, however can expand to 14. There is a front zip around organizer pocket in the front and side water bottle pockets on the side.